I’ve been asked countless times about why I moved to WordPress from Blogger so I figured it was time I put fingers to keyboard and tell you my reasons. I started my blog in December 2008 on Blogger and it was working great for over a year. Then back in the Spring of 2010, things went a little crazy in the blogosphere. Blogger blogs began to be shut down by Blogger for no apparent reason. These were legit blogs on my daily reading list and the bloggers received no warning. Their site was there one minute and gone the next. I freaked. I had just started monetizing my site and growing my following and decided being on Blogger was too much of a risk to take. I seem to have the worst luck sometimes, and wanted to move my blog ASAP. So yes, fear was a factor in my decision- a big one! I pay for my hosting so if my site goes down, I call my host’s Technical Support and talk to a person and explain what’s happening. In Blogger, it is very difficult (sometimes impossible) to get assistance in the Help Forums. I own my site; on Blogger, Google owns it (and they host it as well). I don’t worry about my site being taken down by Blogger if it’s flagged as spam. Many legitimate blogs have been taken down by Blogger this past year and some never to return. For example, Shelley’s Swag was a blog I read and her blog disappeared. She was not a spam blog. Freebies4Mom was on Blogger and was shut down. They have since moved to WordPress. More recently, ChaChing Queen’s site was shut down by Blogger. I thinks she was able to get it back up and running though. The plugins are fantastic! There is literally a plugin for everything and they are so easy to install. I recently discovered the StumbleUpon plugin which allows people to Stumble my posts. I remember on Blogger I could NEVER get the TweetMeme code to work so that people could retweet my posts. On WordPress, it worked as soon as I installed the plugin. I host my own images on my host’s server and have no need to use Photobucket. I love the themes and how many options there are available. I know there’s downfalls to WordPress too like the added costs, but it feels like they are worth it to me. I am very happy I switched! I know it was scary for me too! I think any kind of change that is unfamiliar can be intimidating. I have been struggling with precisely this question myself for almost a year now! Thank you for sharing your perspective! all great points. Thanks for the info. I have been thinking of switching over too. all of a sudden my blog shut off the edit, to edit the layout so now it says it’s not available or bad request! UGH!! I may be hoping over to word press very soon!! I moved in May and had over 3000 followers back then and I didn’t lose any…yours will move with you too. I hired Jessica at iDesign to do my move and she was able to transfer everyone over safely. Check out my post on the steps to moving your blog…I hope it helps explain the process! Thanks for sharing your thoughts on this Stacie. Thanks to another post on this subject, I have started a test blog on WordPress just to get a feel for it. I am not comfortable enough to even consider switching over, and the cost does worry me a bit. If I can figure out the html myself, then I might make the move eventually. Right now it just seems very overwhelming. yeah, the cost worries me too. if you find sites that teach you to switch yourself, can you share the info? I will share when I find some definitely. I agree – I also started “playing around” on WP to see how it is and am TOTALLY overwhelmed. As of now, it would take me hours just to put up one post. I am on blogger (for almost a year now) and have really considered moving to wordpress myself, however, I’m afraid to. Does moving effect my following, ranking or traffic? I also don’t have any clue which is the best host to use. Let me know if you have any qs! You will love WordPress! Thanks for sharing! I have been wondering about wordpress. Thanks for explaining what happened to Shelleys Swag, I displayed her button and one day the blog was gone.. Boy am I glad my web designer insisted on hosting my blog ; http://www.blog.slimybookworm.com and using wordpress platform. I shared your frustration on not being able to put in a tweet application to my posts on blogger. That is very good information to learn. Thank you. Ut oh, You have me worried. I just went to word press and am still using blogger. I’m not sure which I even have. My addy is MomToGrandma.net. Oh boy I guess I better check it out it only cost a small amount but I had someone start it, which costs too. I know they don’t allow RC but I am checking Google Docs and the new out by invite only looks nice. Thanks for the info. Well, all good comments and certainly something to consider but now for me right now. I am not that technologically sound so that change is good for me at this point. It takes me a while to get to where I want to be with Blogger. The trouble with technology is that something new and better always comes along. I had initially wanted to go with Word Press, but my teen is my web designer, trouble shooter, etc. and she said she couldn’t help me if I went there. So, I went with blogger. I haven’t had bad problems and I’ve never heard of anyone’s blog being removed, Not that I’m questioning you. I’ve just never heard of that. The one thing I really don’t like is the storage of photos. Picasa keeps them right our there for the whole world to search and steal if they wanted to. You have no way of having privacy. I realize that they will be seen on the blog, but I just don’t want them sitting in a public pool. I tried making the setting private and they ended up disappearing from my blog. It looked horrible for a few days until I changed the privacy setting. I hope it works well for you Stacie. Keep us all posted. Can you recommend any WordPress blog designers? Thanks for the info Stacie. I had wondered why one blogger used blogger and one wordpress. Now I understand. There is alot of facts you have to consider before you decide which you want to go with. Plug ins. OMG. My favorite thing EVER. If I had known about plug-ins from the get-go, I never would have done Blogger AT ALL. I was thinking of switching to WordPress, but I think for now I am going to stick with blogger. I am getting my blog redesigned. I had a blogger site ages ago. I had switched over to wordpress on my last blog awhile back. I had decided to take a hiatus for a little while and unfortunately didn’t notice my domain had expired during that time. So I am now starting over with a new domain and a new everything. I still prefer wordpress self-hosted over any others. I use Windows Live Writer to make my posts. It is so simple to use. I don’t have to log into the site to make my posts. Plus, Live Writer has its own plug-ins too. So I have even added benefit of those plug-ins. I saw the ad on your site for hubpages. Can you tell me anything about them ? Do you mean the big ad at the top? It’s through Blogstand Media and there’s always a different rotation of ads. Sorry I can’t be of more help! Two questions since you are so helpful and willing to answer. Since I already have my own domain (though I’m on blogger) would that mean I would retain all my traffic numbers? Also is your comments here through WordPress? Or Third Party? I love how you can actually reply back to people here on your blog. Yes, if you have a domain already your Alexa rank won’t change. My theme is WP Ellie (Solostream) and the reply back is acutally a plugin called ReplyMe. Great info Stacie, thank you very much for this much needed post. With this new year, and I am wanting to move ahead in my very new blog, I have been wondering about the .com and hosting issue. Now I am learning from this post that there is wordpress.com and wordpress.org. can you please tell us what is the difference, if any and your recommendations? Also what about people like me, whom barely knows how to do the html code, I am with blogger and I like the fact it is so easy to navigate and add things like “gadgets”, pictures and videos, etc. how exactly is it with wordpress, like ease of posting, ease of posting text with either pictures or videos which I do ALOT lol. Also when switching over, I wont loose my followers or subscribers? Though I have some, not like you and others yet, I will one day I hope, I just do not want to loose anyone while I am in the middle of a change, ya know. I wont loose any content from my actual blog either? I would love to know the costs that are involved with the design and move of everything as well as the monthly fee, that of course would have to be sent through private email here is my email mari(dot)teaches(at)gmail(dot)com Thank you for all the help and info. Big difference in the .com and the .org of WordPress. I am referring to the .org or the self-hosted version. The .com is the free version and is the same as blogger in that you don’t own your content. You also cannot post certain scripts on the .com. I’ve never used it though so I can’t say firsthand. I don’t know html code either and I still am able to use WordPress. To me its very user friendly. It didn’t take me long to figure out where things were. When I switched, I took all my followers and subscribers with me. I was concerned of losing my followers because I had over 3K at the time, but my designer Jessica assured me they would follow me over and they did. Same thing with the content, it all moved with me too. The costs all depend on what you want. I had someone move me because I had no clue what I was doing…to me it was worth it, but some might want to try it on their own. I’m sorry but this is utterly false FUD. It’s even in bold font..
Everybody has the right to express and promote his/her opinions, of course, but when it comes to facts, please let’s try to stick to the truth. I think what she meant by not owning your content is that Blogger and WordPress.com can choose to remove your content any time they want with little recourse for you to get it back. I personally went from Blogger to WordPress many years ago. It’s well worth the switch. Thanks Lisa- that’s what I was trying to convey! Argh, I just started my blog on Blogger. I set it up on wordpress.com a few weeks ago, only to realize that I should have done it on wordpress.org (so stupid of me, because I have actually set up blogs when I was in school on wordpress.org before!). Now I’m totally kicking myself! I actually work to find spam blogs for a major search engine and it’s amazing to me that Blogger would take down perfectly legitimate blogs when there are so many out there that are CLEARLY spam, with scraped content, etc. It’s easy to tell the difference between the two! I too love being able to host my own images. I can change my button anytime and it will update everyone’s button!!! And the plugins!! Goodness how I love plugins. You can customize so many things without touching your code or knowing anything about code! Hey Stacie, this is Brett from the Blogger team. I stumbled upon this post and wanted to chime in with a few comments about some of the things you laid out. We’re sorry to see you go, but also want to let you know that the door is always welcome should you decide to come back. > I pay for my hosting so if my site goes down, I call my host’s Technical Support and talk to a person and explain what’s happening. In Blogger, it is very difficult (sometimes impossible) to get assistance in the Help Forums. > I own my site; on Blogger, Google owns it (and they host it as well). This isn’t true- you as the blog owner definitely own all the rights to your blog, and Google makes zero claim to what you’ve created. > I don’t worry about my site being taken down by Blogger if it’s flagged as spam. We have a methodical process for reviewing spam and take any false positives very seriously. Since spam detection is still an imperfect science, we will always take a look at any case that comes our way. Again, feel free to bug me directly about this! > I remember on Blogger I could NEVER get the TweetMeme code to work so that people could retweet my posts. While we don’t offer plugins, we do have tons of gadgets and features which are already available for you to use. For example, we have a new Sharing feature which lets you and others Tweet your blog content. It’s a setting in the Blog Post widget! > I host my own images on my host’s server and have no need to use Photobucket. No one should have to use Photobucket! Blogger offers free, built-in image hosting on the powerful and reliable Picasa service. >I love the themes and how many options there are available. In the last year we’ve release a brand new set of templates as well as a powerful new Template Designer for customizing, tweaking, and building your own- all without having to touch any code! Thanks Brett- I appreciate you taking the time to comment and teaching me a few things I did not realize about Blogger. I have to disagree with Brett. I know many people who weren’t spam get pulled off Blogger and there isn’t just anybody you can call to get it back up. Help forums just doesn’t cut it for me. That’s what I was trying to say too…it is real and DOES Happen. Those blogs that I listed were just a handful that I know of that were taken down and were not spam. I love my WordPress Blog. I have mine through what.ismyblogs.name. I agree, the plugins are awesome and so is the support. And maybe it’s just me, but it seems much more professional than the Blogger blogs. As a person who works PR and is a blogger, I recommend to our clients that they don’t use Blogger blogs. There is just too much spam Blogger blogs. Plus, having your own domain and paying for your own hosting shows commitment on your part. It shows that you won’t be here today and gone tomorrow. Know what I mean? Totally! To me it’s like taking your blog to the next level to move to WP. I actually upgraded my blogger blog for only $10.00 a year so they host it and I have’nt had any problems. Hey, but just in case I am writing Brett’s contact info down! I’d just die if it disappeared. I am also going to talk to him about all my comments being removed for spam. They are contest entries, they are not spam! I’ve tried the forums for this problem & it’s no help at all. If I could get this problem fixed I’d be really happy so I’m glad you wrote this post. I moved to wordpress over a year ago and totally screwed up with who I got to move me. I am still trying to sort out posts. Plus, my followers didn’t come with me. 🙁 I had to beg, plead and borrow to get them back and not all came. 🙁 On the other hand… although I am LOADS bigger now than I was when I moved… I would move again in a heartbeat even if I lost my followers! I LOVE wordpress and can’t imagine how I handled blogger. LOL! I pay about 55 dollars a year for my host. Most of us can get 55 dollars a year for a host. Who moved you? That’s awful that they lost your followers?! Yes, I pay about $60 for shared hosting…although now I am looking into getting a Dedicated server and it’s big bucks. a company that is no longer in business.. hmm wonder why? ROTFL! I feel for you! That’s terrible that they ruined what you worked so hard to get. I am glad they are out of business now. So sorry! When I started out, I used blogger, because it seemed really user friendly. As soon as I started to get serious about blogging, I didn’t like it at all. I felt too restricted, and I was worried I’d lose my site. I love, love, love the freedom of wordpress and the tech support I get from my hosting company (I use hostgator, and totally love them). Definitely wouldn’t switch back. I started out on Blogger as well. However, I realized that I needed to move to WordPress if I wanted to gain control of my site and content. I have to agree with you. It does cost me money (which is a big deal to a college student), but I like not having to worry about Blogger deleting everything I’ve worked for. I switched to WordPress from Blogger in 2009 and it was the best blogging decision I’ve ever made. You convinced me awhile back to switch and I’ve never looked back! I had a ton of issues with formatting on blogger – difficulty getting a post to look like I wanted it to look. I don’t have any of those problems on WordPress. Blogger has greatly improved uploading photos, but WordPress still seems to be more efficient. I spend more time on writing and less time on technical issues. 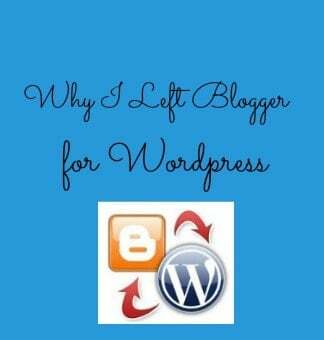 I am getting ready to make the switch from Blogger to WordPress for many of the reasons you stated. 1) Blogger can take you down at any moment, without warning, without reason, and it can takes forever to get an answer. 3) The help forums on Blogger are…. let’s just say I do not even bother. I’d add that a blog on WordPress looks more professional. Since you have to pay for hosting and your domain, you’re putting money into your own business. I actually met Jessica from iDesigns at CES and she was telling me the glories of Wordpess… but Im still uneasy. I don’t do a whole lot of monetizing, but would be interesting in exploring it more actively. She says that wordpress will give me more tools to do so, but Im scared! and honestly, wordpress is overwhelming to me. I have also moved my site from blogger to wordpress. I am happy I did as I really like the style of wordpress and all the themes. It has been only a couple days but I am already happy with it. Stacie, I have read your post and I have been thinking about switching to wordpress.. It has been a debate for a while with me.. I own my own domain for web space and I have an option to put WordPress on it I just never really messed with it.. It is something I am going to look in to.. Thanks for following!! You will love WP. There’s so much more you can do with your website. There’s actually a button on my sidebar for an ebook called How to Move from Blogger to WordPress that might be worth checking out if you are doing it yourself. I hired someone to do mine, but I know that doing it yourself is more affordable. Wow looks great!! I wouldn’t even know where to start with it so that’s awesome you are doing it on your own. Impressive! thanks for all the wordpress tips 🙂 and info ! Can you recommend anyone to move me from blogger to wordpress? My friend said she thought she saw something on your site to that effect. PS, I am a new follower of yours and am grateful for all your info! Hoep to meet you at Blogher12! Absolutely! Number 1 reason is the plugins. Number 2 would be the stability. On a related note, going with Google Adsense for monetizing is equally risky. They will flag you for improper use and shut you down in a heartbeat! What I really like about WordPress.org is that I have full control over the software. I can freely modify it, not just themes and plugins. I am convinced, and I am currently in the process of moving to WP. I am nervous about it, but the advantages just seem too big to NOT move. Hopefully I will figure it all out. Great post! Pretty much sums up all of my reasons for moving too. It seemed so intimidating at the time, but now I’m so glad I did it.